THAT'S Everard "Gally" Cummings, Mr. Prime Minister. And the Trinidad football star who was voted the "Player of the CONCACAF series" recently in Haiti is introduced to Dr. Eric Williams (right) by Ivan Carter (left), the Chef de Mission of the team. This happened at Friday night's cocktail party hosted by the Prime Minister at Hilton in honour of the Trinidad and Tobago team, runners-up to Haiti in World Cup eliminations at Port Au Prince and winners of $47,000 prize money. 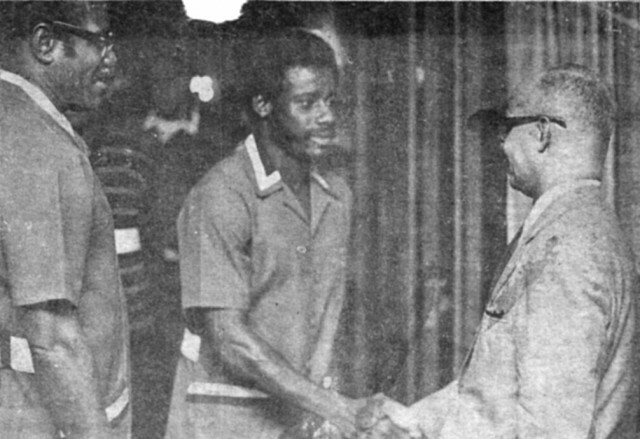 The Trinidad team was voted the best team in the tournament and Cummings, the best player; Kevin Verity, the best trainer while four players were included in the ideal team — Warren Archibald, Kelvin Barclay and Steve David and Cummings. - Read tomorrow's EXPRESS for a special feature on star player Everard Cummings.